A 73-year-old man presented to the dermatology clinic with a persistent, generalized rash that had been present for 3 months and was associated with occasional itching. He had no history of any previous dermatoses or drug allergies; he was an active smoker, with a smoking history of 40 pack-years. Physical examination revealed a symmetric, generalized erythematous rash, with overlying scaling and desquamation involving the hands and feet. He was initially treated with topical glucocorticoid therapy, then with oral prednisone and antihistamines, and then with intravenous glucocorticoids, but had no relief. Skin biopsy revealed a slight acanthosis and parakeratosis with a granulocytic infiltrate — findings that were consistent with an erythrodermic dermatitis. Given the patient’s smoking history and concern that there was an underlying neoplasm associated with the dermatitis, a radiograph of the chest was obtained, which showed an opacity in the left lung. Paraneoplastic erythroderma was suspected, and computed tomography of the chest confirmed the presence of a pulmonary nodule in the left upper lobe. The patient underwent upper lobectomy of the left lung and lymph node dissection. Histologic examination revealed a moderately differentiated squamous-cell carcinoma. 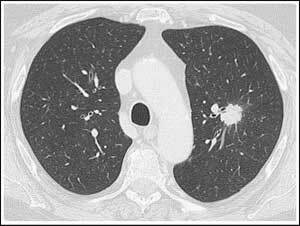 Paraneoplastic erythroderma is an uncommon initial manifestation of lung cancer. It can also be associated with hematologic cancers and other solid-organ cancers. One month after resection, the patient had complete resolution of the rash. One year later, he had no further rash or tumor recurrence.